South of Milano and at only 16 km from Pavia, it is possible to get married through a civil ceremony valid by Law at Villa Cantoni, recognized as Casa Comunale by the Municipality of Gropello Cairoli. This possibility, available also to those residing in other districts than Gropello, will give you the chance to live all your civil ceremony in a suggestive and romantic atmosphere; you won’t have to go to the town hall before moving to the Villa or to seek help from some “actor”. The civil ceremony can be hold indoors in the ancient library room in front of the lit fireplace during winter, or in the garden under the blooming arch. Our suggestive location is perfect also for other kinds of ceremonies and weddings. According to law, marriages in Italy have to be celebrated in a Casa Comunale (municipal house, tipically the town hall) in your residence district or in another one. During last years, thanks to the spreading of this kind of ceremonies, many italian municipalities have decided to designate as Casa Comunale also other places than town halls, peculiar locations such as castles, historical villas or palaces. 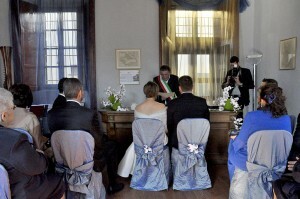 In these places designated as Casa Comunale it is possible to celebrate a real civil ceremony valid by Law, without the need to complete any bureaucratic work at the town hall. The entire ceremony, from the reading of the act, the rings exchange and the signatures, can be hold in a location of your choice. Villa Cantoni is Casa Comunale of Gropello Cairoli since 2008: here you can celebrate your wedding with a true civil ceremony valid by Law, also if you reside in other districts. Wether you choose to hold your ceremony in the garden surrounded by the charming centuries old park, or in the romantic frescoed indoor rooms, you will be able to organize and customize it with your music and details. To make the organization of your civil wedding even easier, Villa Cantoni team will take care of all the bureaucratic and administrative aspects. You will only have to go to your town hall for the public notification of marriage: then you can deal with all the procedures with Gropello Cairoli municipality via email, helped by Villa Cantoni’s staff.